Look who's shopping? 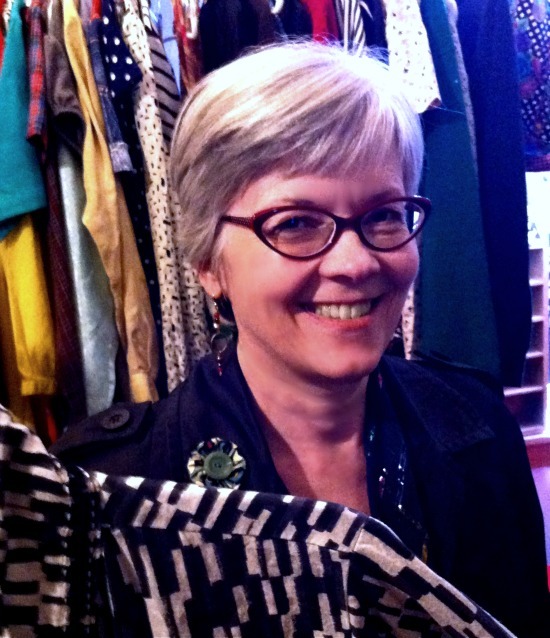 Why, that's the brilliant Val Sparkle, of Late Blooming Sparkle, who recently took a trip up to Seattle, and made some time to do a little shopping in Fremont. IT WAS A PLEASURE to meet, shop + hang out with Val! While the time was short, I felt instantly at ease with her. Hopefully I can make a trip up to her stomping grounds soon, and hang with Val some more. Val found a little something to take home from my stall in Atlas, and I can't wait to see it show up in one of her outfit posts. She's already written about her Seattle trip HERE. Another lovely woman sparkling at Atlas, is the serene beauty seen above. Meet Jackyn. She's wearing her new Citizen Rosebud find, a pre-loved red synthetic leather moto-jacket by IZOD. You may have seen it already, when I wore it HERE. I think Jackyn looks amazing in her new coat, and I love it with her gorgeous turquoise/navy romper. NEW! 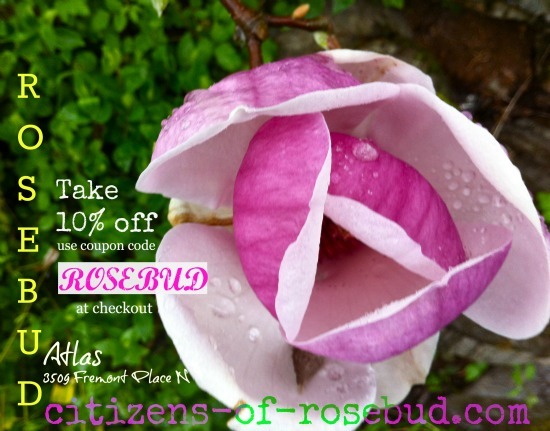 Now there are coupon codes for all friends, fans + readers, at any Citizen venue. 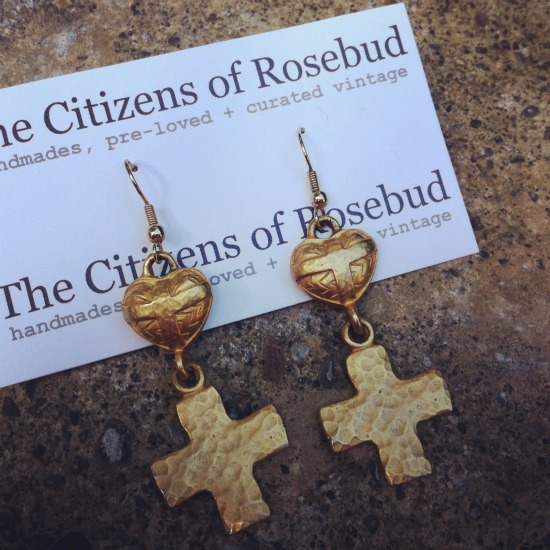 Just whisper "ROSEBUD" at checkout and you'll get 10% off your purchase of any Citizen Rosebud goodie. And, that includes snow globes. Your stall looks so inviting and both gals picked up some cute items from you that I know were priced just right! Have a killer weekend! Do you think we'll see the sun today? What a great picture of Val. Happy to hear that you had a nice visit! Val really does sparkle, doesn't she...and even more so in those gorgeous earrings. Jacklyn looks great in her new jacket and I LOVE her hair; two ladies with great style looking even more stylish after visiting your stall! *waving* Hi, Val! Glad you guys got a chance to meet. Nice to meet other bloggers! Nice pic of Val and those Earrings are fabulous! Hey, it's Val! How cool that you two got to meet and she found something at your stall to take home. She has great glasses! Helllooooooo (waving back)! I styled the great topper I got from your place and it's on my newest post! Can't wait to meet up again sometime, Bella - I keep thinking of more things I want to talk about! Val looks fantastic in your boutique finds. 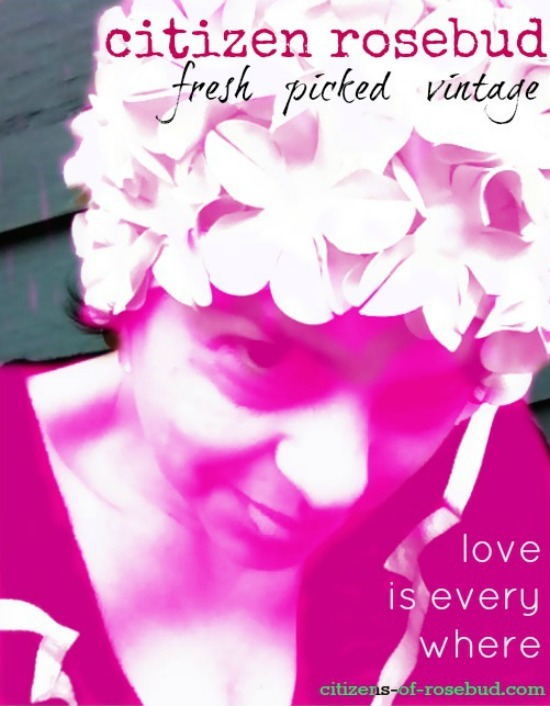 I see more and more traces of Bella magic all over blogland. And how could I forget to mention how much I love that red jacket on Jacklyn! You met Val! How great! She's so sweet and humble!! Those are neat earring and the card they are on is great. Nicely packaged. How I wish I was on the West coast and be able to come to Atlas! !